Image Size: 32.25 X 39.5 in. "Venus is the Roman name for the Greek goddess Aphrodite," says the artist. "Generally, Venus is the goddess of love and sensuality. 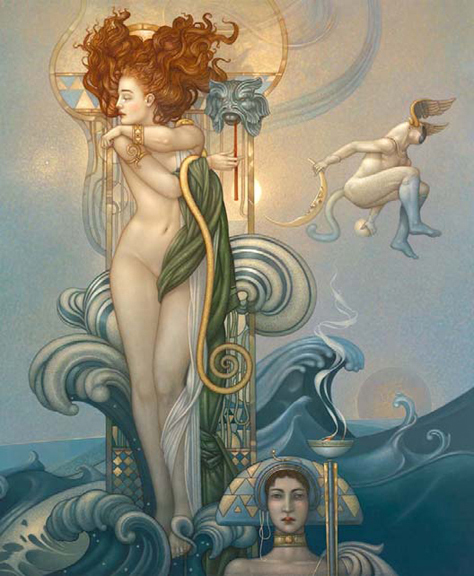 Venus represents the descent of divine feminine energy into the physical world. The waters of the sea can be seen as the tumultuous emotional body of humanity. She is the balance for the present distortion of aggression on earth. Her presence is of calm, knowing, patience, and love. Her tools are not the swords of the battle field but of beauty and harmony. "I have used the flying figure before in my paintings. He represents the announcement of a major cosmic event. Here he is announcing a divine being, or consciousness,descending into a physical form to help the earth. "The mask that Venus is holding is the mask of sorrow, confusion, and misery. Behind the mask, there is the promise of what this feminine energy brings.